Lisa Lauten grew up skating in Milwaukee, Wisconsin. A small town, but she had big dreams! Immediately after graduating from High School in 1979, she was offered contracts with both Holiday on Ice and Ice Capades. At her coaches' encouragement she chose The Ice Capades. Lisa toured with the East, West and Continental Companies from 1979 to 1983. 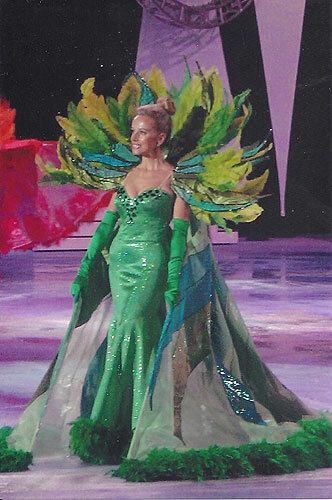 She was cast as an "Ice Capette" but also as a "flyer" by world renowned Peter Foy, of "Flying by Foy." Lisa was also chosen as Ice Capades poster girl for the 1984 to 1985 season. Her other shows have included Fire and Ice at the Hacienda Hotel in Las Vegas, Nevada, and Richard Porter’s Production in Atami, Japan. Lisa is currently involved in the biggest production number of her life…raising six children. Gretchen, Tyler, Nicholas, Olivia, Abigail and Carolyn are directed, choreographed and produced by Lisa and her husband, Steve Baumann. She met her husband on a golf course while taking a few months off before starting a show in Australia. He literally swept her off the Ice. They have been happily married for 21 years and are living just outside of Chicago. "The friendships I have made during my time in the ice shows are irreplaceable, in fact they are priceless. We became a family. We all shared the same passion, the love of performing. That is the bond that has kept our friendships intact after all these years. ~Lisa Lauten Baumann"
Without a doubt, ICE CAPADES was an exciting glamorous experience and showcased the hottest and most innovative ice skating talents from around the world. The skaters, choreographers and staff became a tight knit family with lasting bonds into today and tomorrow. After Ice Capades, I pursued a successful career as a graphic artist in Los Angeles, London and currently Chicago. While I enjoy my work today, I also treasure the cherished friends and fantastic experiences that figure skating enabled. I look forward to reconnecting with my extended family and friends in Las Vegas for the 2010 ICE CAPADES REUNION. If you have not yet signed up please visit www.tdc.ca/icecapades/2010reunion.htm and sign up. Jola Iglikowska Originally from Poland, Jola started her pro skating career in 1969 in South Africa with Producer Marjory Chase. She went on to skate with Holiday on Ice/Europe until 1976. From 1976-1981, she skated with Ice Capades, and in 1984 she performed in Fire 'n Ice/Las Vegas at the Hacienda (Producer Jerry Jackson). She then went to skate in Japan for Producer Rick Porter and later returned to Las Vegas to do "Nudes on Ice" at the Plaza Hotel in downtown Las Vegas. More recently, she appeared in Legends on Ice in 2004 and played with the show in Long Beach, California and Caesars Palace, Las Vegas. Jola is now married to Mike Bench and has remained in Las Vegas. Her Mom ("Momma") has moved over from Poland to join her. Jola has a real estate license and is actively involved in the housing market. She also works at Neiman Marcus on the Las Vegas Strip. Jola says, "I am blessed!" A spectacular scene in a Sonja Henie movie sparked my love of theatrical skating and I began to collect pictures and magazine articles about ice shows. While learning to skate I dreamed of someday getting into a show and loved being part of the great 1950s and 60s ice show era when those prayers were finally answered. First, at the Casa Carioca for a year and a half in Garmisch, Germany; then five years in the Boulevard Room show at the Chicago Conrad Hilton Hotel; and eventually touring with Holiday On Ice for six fantastic years in Europe, Russia, South America, and Asia where I developed a life-long love of Thailand and Japan. At the end of my last show tour in 1967 I planned to head to California to begin a new career as a photographer. The cast was flown from Rio de Janeiro to New York City where I expecteded to visit friends for three days....and stayed twenty-five years. For the first two of those I skated in a small exhibition four times a day at the Rockefeller Plaza ice rink. That financed the Manhattan studio for my “second life” photographing actors, dancers, musicians, and other entertainers - from great international stars to fresh-faced hopefuls. All the while I continued to gather memorabilia from the spectacular touring ice shows and those being created by ice champions who were becoming great skating artists and forming their own companies, and I documented the surge in popularity of skating on television.